Do you like my new key holder? I have seen these popping up everywhere and finally decided to make one. The old keychain holder I had kinda sucked, so I needed one that was more fun! I cut out my mustache, and I was going to trace it onto my wood but it kept moving. So I took the lazyman's way out and tacked the freezer paper onto the wood, sprayed around it lightly with black spray paint, then traced around the image that was left. I used my jigsaw to cut it out. It got a little tricky in the curvy part of the stache, but I managed not to lose any appendages! I gave it a nice sanding, stained it with one coat of Minwax Dark Walnut, then screwed on my hooks! I bought a nice block of wood from Lowe's for $10. I'll be able to make two key holders out of it and I have a little wood left over. Since I used the hooks from my old key holder, this only cost me five bucks! I love the imperfections of the wood! Now I've got a funky little key holder! I'm thinking these will make some good Christmas presents! Oh my gosh!!!! That is fabulous! Thanks so much for linking up! Ah ha ha ha ha..... that's funny. And cute. You know I want this Katie! It is too cute!!! PS I also love that little key fob with the rainbow flying geese! This is really cute! 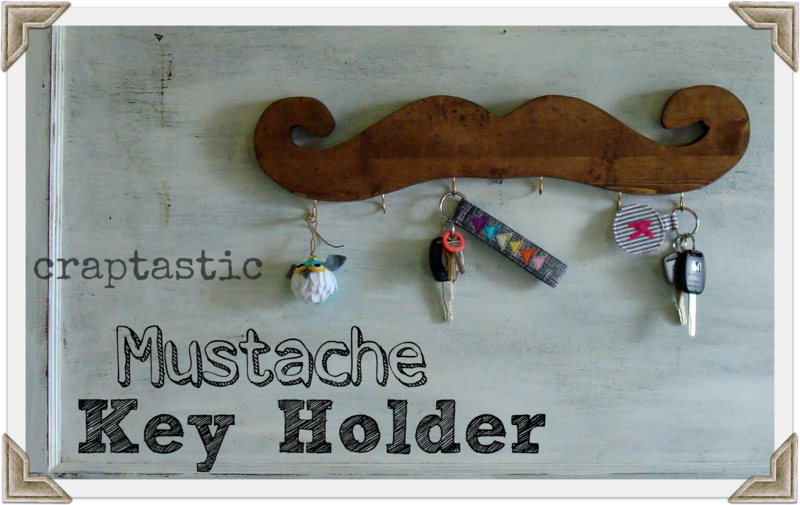 Now I have to make one for my Uncle who has this kind of mustache! Thanks for sharing! Love it! I just came across your blog, and the name completely cracked me up. Would love if if you linked up on my blog hop www.w-t-fab.com/search/label/bloghop. Also let me know if you'd like to follow each other!